Joe Pernice, Teenage Fanclub's Norman Blake, and the Sadies' Mike Belitsky give us a lush collection of clever but bittersweet songs on Into the Lime. 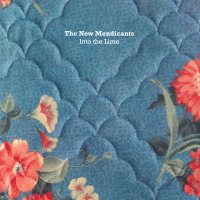 The New Mendicants is a project from Joe Pernice, Teenage Fanclub's Norman Blake, and the Sadies' drummer Mike Belitsky. Their first offering came last year in the mostly acoustic, understated but solid Australia 2013 EP. But that collection could not have predicted the lush, excellent pop songs that comprise Into the Lime, the band's first full-length. The set can shift dynamically from stately folk to driving power-pop to lilting hazy tunes without showing its seams. The combination of Pernice's melodic tendencies with Blake's history in Teenage Fanclub is a perfect match. Some songs, such as driving standouts "Very Sorry Christmas" and "Shouting Match", marry Pernice's somber hooks with the crunch of early Teenage Fanclub, while other tracks such as "High on the Skyline" link to Blake's more recent love of pristine vocal harmonies. In short, these are expertly constructed pop songs, but they also have a breadth of tone and mood. They can shift from the absurdity of a foolish love triangle on "Cruel Annette" or the upstairs lovers' spat of "Shouting Match" to the bittersweet fragility of "Follow You Down" or Blake's great version of Sandy Denny's "By the Time It Gets Dark". Approachable yet sly, clever but heartbreaking, Into the Lime is another great set from players who seem to have their lion's share of those already.